It has been months since I last decently updated here! :D Time and energy is lacking me to update, so I'm really sorry. But here is my try on an update. You can go to my Flickr page or Ravelry to read more details about the socks. From left to right, starting at the top : Socks for my youngest sister, socks for my grandma, socks for my other sister, socks for a friend (need to fill up the mosaic! :D), socks for my aunt and the recently finished socks for my boyfriend. Missing are the socks for my mom (see previous post) and the socks for my grandfather (no pitures taken ...). Pattern : Pomatomus by Cookie A. Modifications : As I ran out of yarn before finishing the first sock (I had 2 balls of 50gr each) I did the second sock with 2,5 pattern repeats for the leg and a shorter heel flap. Then I redid the first sock. They look great, I only barely made it the second time! The other pair I finished was the pair of Hederas I started back in September (I think). I have no pictures of them though. I'm stilling trying to keep up with 2 sock challanges. First one is the 52PairPlungeII. 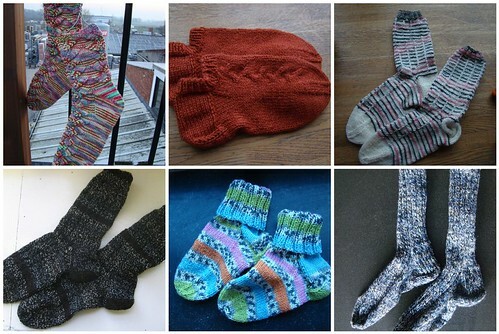 I have now 26 pairs done, which is halfway. I probably won't make it to the full 52, but I'm halfway so that's ok. I'm also still in the challange of the Sock Knitters Anonymus. I probably won't finish a February pair (we have till the end of March to finish it), but so far I did quite ok.
Knitted out of Cashmere I got through Posh yarns (some Yarn club) but I overdyed the yarn as I didn't like the original colour. 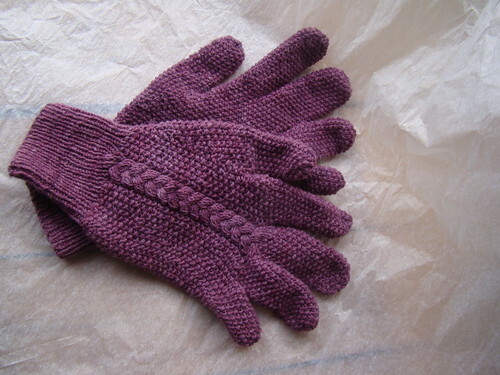 The gloves are wonderfull and got quite some wear during the cold Winter! Gorgeous knitting as always :) I read about the no appreciation on Rav (actually, I'm still reading that thread). Will post there soon. I just finished a fun quick sweater. It is the Miley sweater. It is in my projects. Lemme know if you're interested in the pattern! Ik zat wat te surfen en kwam via Ravelry hier terecht. Mooie breisels heb jij al gemaakt! Hello my dear! Of course I remember you! I'm glad to know that you wrote me a letter, I look forward to reading it! Don't worry, I understand what it's like to reply months later... I've been there! Your socks are so cute! I love them. Especially the ones that you posted on November 17. And I love the photo of you and your horse!